Great Vintage Port was made in 2007. I love the combination of power and finesse in these young blackstrap fortified wines. What strikes me is how polished the tannins are. I was spellbound by the top Vintage Ports of my tasting. are supported by fine, tight-knit tannins. Jancis Robinson selected 15 of the 2007 Vintage Ports as her ‘favourites’ at the London tasting where forty-two 2007 Vintage Ports were on show. Symington wines are 7 out of the 15 – nearly half of the ‘top wines’ listed in one of the world’s most influential newspapers. This is really quite a remarkable achievement. ranks Symington wines on top. worth buying now to put away for a decade, perhaps two, before they are ready to drink. 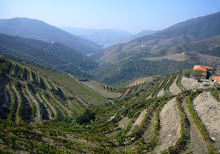 Bárbara’s peppery grip and Churchill’s Quinta da Gricha’s intense mulberry fruit. Port wine expert Roy Hersh recently concluded one of the most comprehensive reviews of the 2007 Vintage Ports, during which he conducted blind tastings of 63 Vintage Ports. Along with the results, Roy also released his TOP 10 list which includes 3 wines from Symington Family Estates - Graham's, Dow's and Warre's. 96+ Graham's “Another pearl in the long strand of fine Vintage Port’s by Graham’s." 97+ Dow's “A stellar Vintage Port from this fine shipper." 96+ Warre's “The best Warre Vintage Port I’ve ever had, at this early stage." Derek Smedley is a distinguished British wine expert and Master of Wine who began his wine trade career in 1961. He acts as a consultant to a host of UK City institutions and is Co-Chairman of The International Wine Challenge, one of the world’s most prestigious blind tasting competitions.